A feedback loop (FBL) is a communication channel with an Internet Service Provider (ISP) that allows abuse complaints to be sent back to WordFly. Abuse complaints are sent when a subscriber clicks on the spam button in their email. Most FBLs are IP based which means that WordFly has already signed up for these. Yahoo! is the only ISP that has a domain based FBL. Learn how to setup the Yahoo! FBL in this article. Yahoo! email account (either a personal account or company use account works). If you do not have a Yahoo! email account, go to https://mail.yahoo.com and select Create Account, follow the instructions to create an account. Are you using Gmail for your company emails? Gmail removes direct access to the postmaster@ mailbox. Open a support ticket with Google, explain you need to set up the Yahoo! FBL using the instructions in this support post and they can help you with the verification code that is needed to finalize the FBL request. Let WordFly support know if you need assistance with any part of this process by replying back to your WordFly onboarding ticket or other open support ticket. 3. Select Complaint Feedback Loop program. 4. 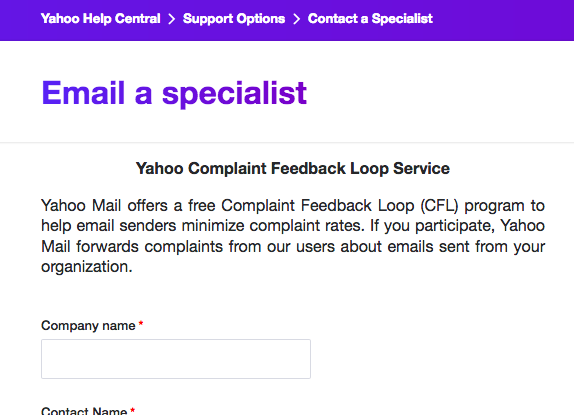 A form will appear with the title Yahoo Complaint Feedback Loop Service. -An email with a unique verification code will be sent to your postmaster@ mailbox. -Keep this form open while you go to find the email from Yahoo. -The email from Yahoo will be coming from 'yahoo-account-services-us@cc.yahoo-inc.com' and IP 216.39.62.112. You can try adding their from address to your contacts list or safe senders list; or, ask your IT team to whitelist the sending IP. If you are not receiving the Yahoo FBL email you might try (1) confirming that your postmaster mailbox is actually receiving any outside emails at all, if you can't find this message you probably have a problem to fix before finishing the FBL, or (2) check to see if your mail server is rejecting the verification code email message because the from line used by Yahoo is too long (this is mostly an issue on the PowerMTA platform). 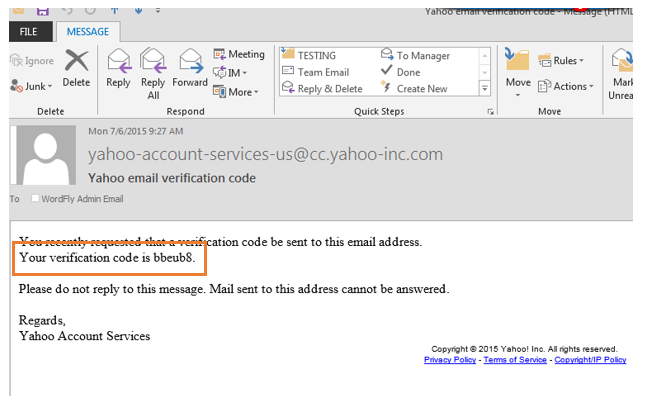 -Open the email from Yahoo and retrieve the verification code. Make sure you have a success message on this form after selecting Create Request. The Yahoo success message will state that it takes up to 48 hours for Yahoo to review and confirm your request. This means the request was submitted successfully. If this was not successful, go through the set up steps again. 5. Let WordFly support know you have completed this form!